The main chiller components are the Compressor, Condenser, Evaporator, Expansion Valve, Power Panel, Controls unit and the Water Box. 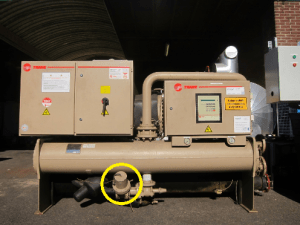 In this article we will learn how to locate these on the chiller and briefly what their purpose is. 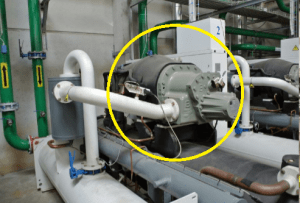 Chillers can be found in most medium to large buildings and will produce the chilled water that is used to provide air conditioning. 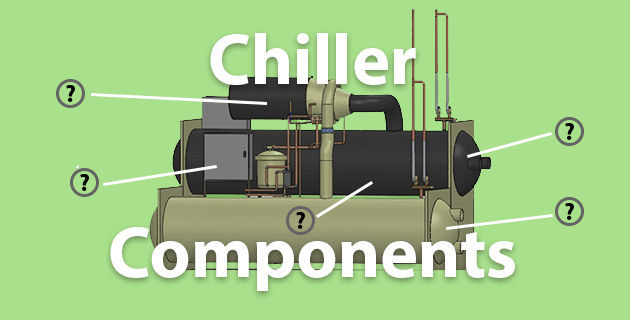 There are many different types of chillers but essentially they all have the same main components. The compressor is the the prime mover, it creates a pressure difference to move the refrigerant around the system. There are various designs of refrigerant compressors, the most common being the centrifugal, screw, scroll and reciprocating type compressors. Each type has it’s own pro’s and con’s. 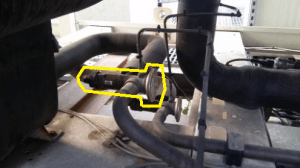 It is always located between the evaporator and the condenser. It’s usually partly insulated and will have an electrical motor attached as the driving force, this will be either mounted internally or externally. 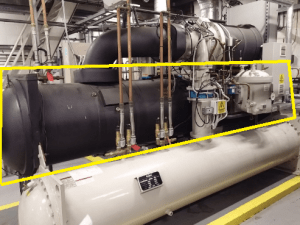 Compressors can be extremely noisy, usually a constant deep droning sound with an overlaying high pitch, hearing protection should be worn when in close proximity to the chiller. 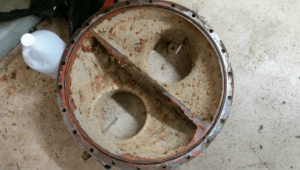 The condenser is located after the compressor and before the expansion valve. The purpose of the condenser is to remove heat from the refrigerant which was picked up in the evaporator. 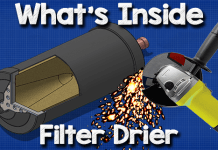 There are two main types of condensers, Air cooled and Water cooled. 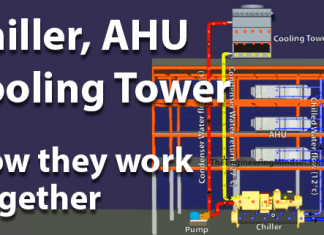 Water cooled condensers will repetitively cycle “Condenser water” between the cooling tower and the condenser, the hot refrigerant which enters the condenser from the compressor, will transfer its heat into this water which is transported up to the cooling tower and rejected from the building. 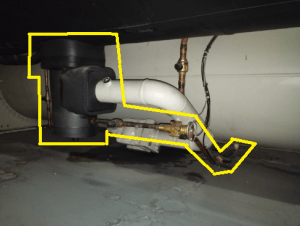 The refrigerant and the water do not mix they are kept separated by a pipe wall, the water flows inside the pipe and the refrigerant flows on the outside. 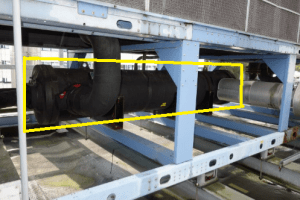 Condensers on air cooled chillers work slightly differently, they do not use a cooling tower but instead blow air across the exposed condenser pipes with the refrigerant flowing this time on the inside of the tube. 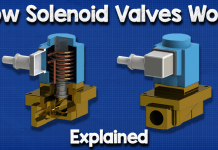 The expansion valve is located between the condenser and the evaporator. 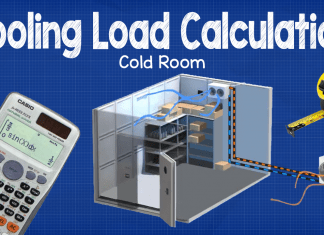 It’s purpose is to expand the refrigerant reducing its pressure and increase it’s volume which will allow it to pick up the unwanted heat in the evaporator. 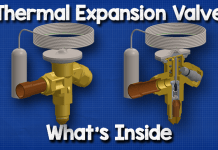 There are many different types of expansion valve, the most common at the thermal expansion vale, the pilot operated thermal expansion valve, the electronic expansion valve and the fixed orifice expansion valve. 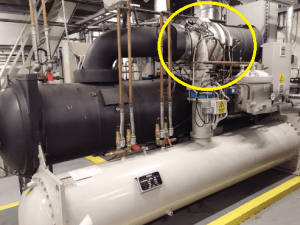 The evaporator is located between the expansion valve and the compressor, its purpose is to collect the unwanted heat from the building and move this into the refrigerant so that it can be sent to the cooling tower and rejected. 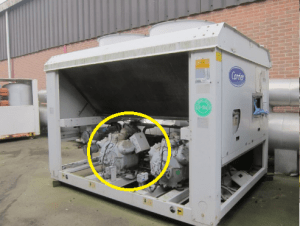 The water cools as the heat is extracted by the refrigerant, this “chilled water” is then pumped around the building to provide air conditioning, This “Chilled water” then returns to the evaporator bringing with it any unwanted heat from the building. 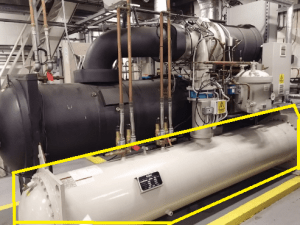 The power unit is either mounted directly to the chiller or it can be seperated and mounted to the wall of the plant room with power cables running between them. 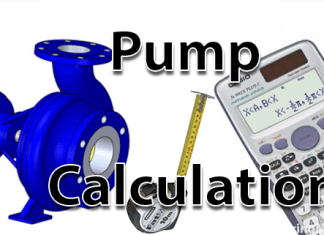 The purpose of the power unit is to control the flow of electrical power to the chiller. 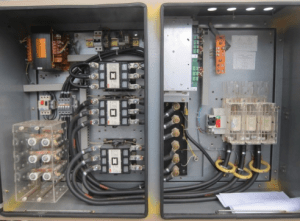 These usually contain a starter, circuit breakers, speed controller and power monitoring equipment. The controls unit is typically mounted on the chiller. 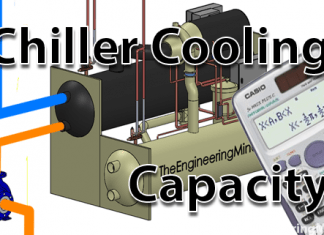 It’s purpose is to monitor the various aspects of the chillers performance and control these by making adjustments. The controls unit will generate alarms for the engineering teams and safely shut the system down to prevent damage to the unit. 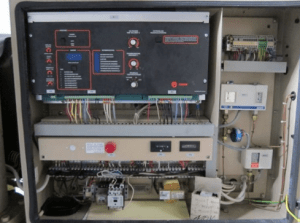 BMS connections are also usually present to allow remote control and monitoring. 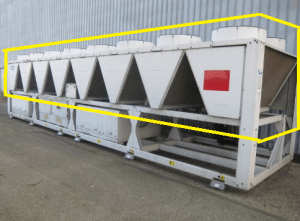 Water boxes are mounted to the evaporators and also the condensers of water cooled chillers. The purpose of the water box is to direct flow as well as as to segregate the entrance and exit. 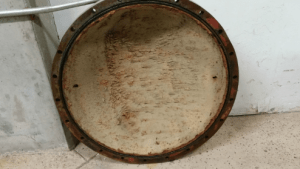 Depending on the number of passes in the evaporator and condenser, water boxes may have 1-2 flanged entrance or exit holes or they can be completely capped and just redirect flow back into the next pass. Best info I found on internet sofar. Good job. thank for your effort in indicating the basic operation but we here that the chillers have more than one compressors. 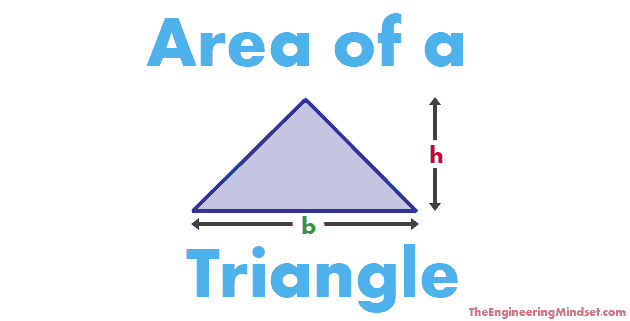 what about its operation. 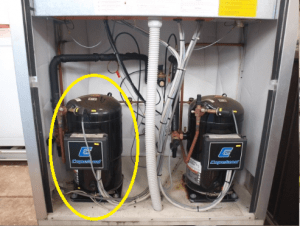 Where we could buy a chiller evaporator for HVAC?